I love Facebook memories! I love looking at pictures of when my kids where younger and fun memories with friends, but I especially love seeing memories about Bible studies I’ve completed. It’s great to look back at memories and reflect on the lessons I’ve learned, but also the distance I’ve traveled since then. I resonate with Priscilla’s statement: You’re not the same person….you have no business going where you used to go. This is truth. This is a process that’s easier when you have a trusted Christian woman walking along side you as you travel this journey called life. When I share my mentoring story, I always begin at 2013, but I realize that my mentoring story really began much earlier. Mentoring relationships at different seasons of my life have blessed and encouraged me. I lived in a Christian home with a godly Mom, who led me to Christ at an early age. As a teenager, a woman of faith at our church came alongside me. She was intentional in our interactions and I always knew I could count on her. As a young adult (and again as a young mom), an Air Force wife spoke into my life! Since moving to Florida in 2004, several women have encouraged me and walked alongside me. What is the common thread among all of these relationships? Simply, godly women have walked beside me experiencing life together. I’m the woman I am today because of their influence. I stepped out in faith to launch a mentoring ministry because these women spoke into my life and believed in me! In a recent sermon, our pastor spoke of the importance of confessing to a trusted friend. How do you find that trusted someone? Ask someone to be your mentor. If you’re not sure what that looks like, get Janet Thompson’s new book Mentoring for all Seasons. This book is a great resource for women. Not only is it the “how to” for finding a mentor or mentee, it’s also a great guide for the different seasons of life. There are testimonies from mentors and mentees who have experienced seasons of life and share how God sustained them through each one. For teaching me to say “No.” For inspiring me to put first things first. For showing me by your example the importance of margin and Sabbath. For reminding me that doing everything is not the same as doing the best things. Thank you. You have taught me that life is better when it has room to breathe. No is a simple word when used appropriately! No is a simple word when used appropriately. For such a small word, I really struggled with it. During our church’s new member orientation, I learned that one of my spiritual gifts was “helps.” I thought this meant I should help with every ministry opportunity. This could not be further from the truth. As I was obedient to say “No” to new opportunities and began stepping away from other ministries, I felt a great peace. The ministries I was involved in weren’t bad, but they were taking me away from home and pulling my attention away from the lesson God was trying to teach me. God taught me how to hear His Voice – in a song, a post on Facebook, a sermon at church, and most importantly, His voice heard in time spent in God’s Word. He taught me that sometimes the right answer really is “No.” As I passed on the leadership for the three Bible studies I was leading, God called two leaders for each one. Two is better than one! Janet Thompson heard the call to “Feed My Sheep,” which prompted her first mentoring opportunity. During a sermon, I could hear the Holy Spirit speak to me about the importance of a mentoring ministry for our church. Even as I heard the message, I began arguing that God could not possibly want me to start a mentoring ministry. God confirmed this new ministry in many ways. Within a very short time, God orchestrated mentoring training, the support of the church leadership, and a ministry team ready to begin work launching the new ministry. When I was faithful to let others have the blessing of leading ministries I loved, I was able to prepare for this new ministry. 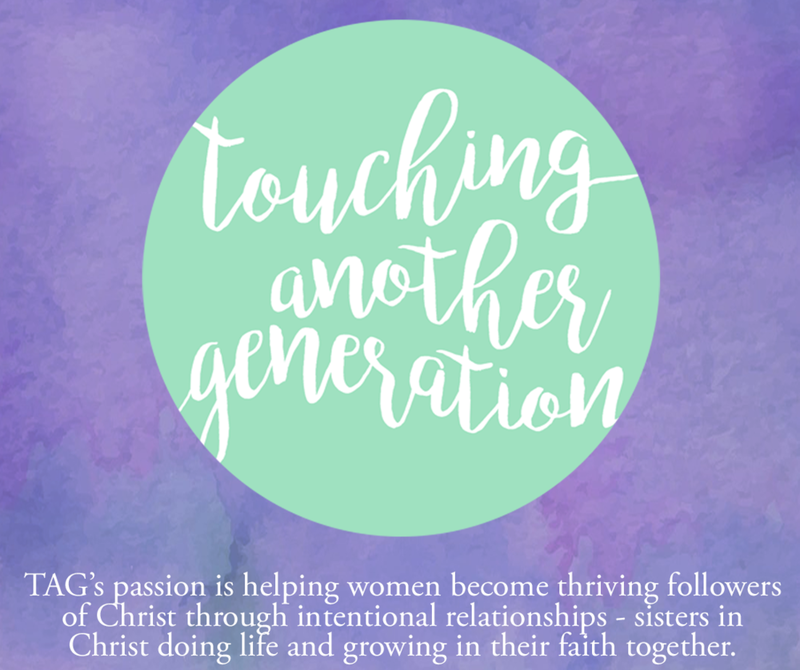 If I had not been obedient to God’s desire for me to step away, I would not have launched the mentoring ministry, “Touching Another Generation” (TAG). Waiting is hard, but being out of the will of God is even harder. God taught me that His timing is best. Waiting is hard, but being out of the will of God is even harder. He taught me that walking with a Sister-in-Christ is something we all need, even me. As we were preparing for the launch of TAG 2016, I was also preparing to return to school to complete my bachelor’s degree. Another benefit of saying No was having the time to devote to school. I still cannot explain how there are enough hours in the week for all God allows me to accomplish, so I won’t try. I’ll just give God the glory. Why am I so passionate about mentoring? I’ve been richly blessed by amazing women God has placed in my life! A mentor can help you discern the importance of a simple No. Mentors don’t have to be Bible scholars, just possess a willingness to invest time in the life of another woman. It may become a source of your greatest blessings. Looking back, I see that God taught me some very important lessons He meant for me to share with others. A mentor can also help you evaluate the events from your past to help you see the lessons God is teaching you now. God created women with a desire to share life with one another. Life isn’t a solitary expedition. In some area of your life, you’re a role model – a person of influence—and another woman needs to hear your story. In some area of your life, you’re a role model – a person of influence—and another woman. This article appeared on Janet Thompson’s website on November 6, 2017.